My choice, Beulah’s 7/8. I had fished the rod single-handed for awhile, throwing in the occasional D-loop as I fished an indicator rig. This technique became too automatic..if you catch my drift. My interests soon turned to the other capability of the rod. Ever since then spey style casting has taken over my train of thought. 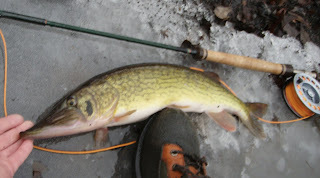 I doubt that swinging flies for pickerel will catch on anytime soon...but for my first fish caught using my skagit head it was an unexpected but welcome surprise.